It was exceptionally fortunate to have David Fearne there. As K&A Trust chair he was able to keep people informed. It was re-assuring to know that anything done to the towpath would be done to exceptionally high standards and must preserve the heritage of the K&A waterways. The CRT are GOOD people. There was a lot of fear about what a smooth surface will do to the speed of cycling along the towpath. It was good to get the focus on to the benefits to everyone else. The path currently excludes people with disabilities and families with pushchairs. It was emphasised that any work to the towpath would also include promotion of the towpath code of conduct. The towpath code of conduct is a key part of educating bad users, not keeping the path in a bad state of repair to hopefully curtail bad behaviour. Further to this, Cllr Lin Patterson emailed me this morning and stated that a public consultation will be held by Cllr Martin Veal (Cabinet Member for Communities Services) [TO BE CONFIRMED WHEN] on this. I will see you there. I will keep people informed as I find out more. I have informed the CRT of this meeting. Hopefully they will be in attendance. Nov 2014 : £114M CCAG Money announced. 12 Jan 2015: With much negotiation this is the final letter: https://docs.google.com/document/d/1qgaIvltlwrtmd0fjVQN1S9S_NeQebB-Ig3fRxgMgX2I/edit?usp=sharing ads the council officer has decided the CCAG bid will deliver two new bridges and the repair to the towpath. LEP money would be bid for to provide the Weston and Newbridge Hill routes CycleBath desperately want done. March 2015: £3.8M CCAG money awarded. Cycle Forum is held, CycleBath begins it’s work on it’s own proposal for expanding the CCAG Bath East to connect better with communities. https://cyclebath.org.uk/ccag-bath-east/ A public consultation is promised. Elections blow things up. No consultation is held. Before the CCAG money came along, council had allocated £180k to upgrade Larkhall path and part of towpath in the 2015/16 budget. This can still be used to ‘fix’ towpath connections. Towpath is cared for and owned by the CRT. They are unbelievably tough when it comes to what is done to the towpath. It is with great relief that I read that the Canal and River Trust are incredibly tough when it comes to making decisions. Let us hope that they support the thoughts and wellbeing of the many walkers on the towpath of the Kennet and Avon canal. Many of the cyclists are rude and speed dangerously by walkers thinking that they, the cyclists, own the towpath. In the 47 years that I have been walking the towpath around Bathampton the behaviour of cyclists (who, incidentally used to pay a licence fee) has changed out of all recognition. There are a few polite ones! I had a thought about that. I think the opening of the Two Tunnels and the promotion of the 13 mile circuit which includes the towpath has probably increased the number of people cycling on the towpath. It might be worth having the towpath code of conduct put on signs at the Beckford Road entrance and at the Canal Centre. The Two Tunnels can get away with “Share the path” as the path is 3m wide and you can easily manoeuvre around people. The towpath currently has restricted widths due to its poor state and there is way more interaction between people walking and cycling. 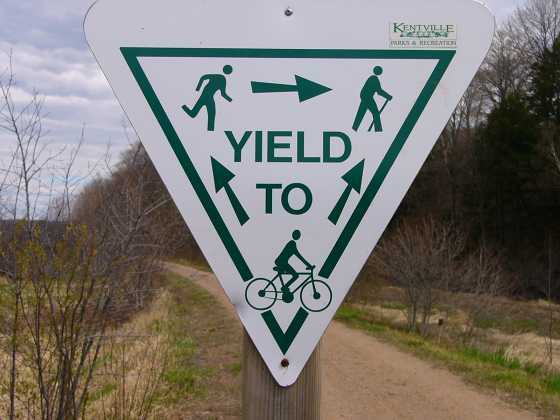 Promotion of the code and maybe signs like http://isolatecyclist.bostonbiker.org/files/2012/04/yield_bikes_runners.jpg (Bikes yield to walkers/runners) should be put up. I don’t excuse badly behaved cycling, but we need to educate. I don’t like cycling on the K&A path, mainly because of being harassed by badly behaved cyclists! So I’m not sure whether or how the new surface (welcome though it is for a more comfortable ride) is going to improve the situation. I remember the cycling passes; still have one somewhere. Don’t recall having to pay for it though. Never got asked to show it either. I rode to BoA with a friend and you get these people cycling along it completely and utterly focused on themselves. The smooth surface has little to do with cycling, it’s more that it’s worn out and excludes people in wheelchairs and push chairs. The issue of badly behaved cycling has to be dealt with through education and the towpath code of conduct. (Hopefully). Whether the path is smooth or rough, you’ll get bad behaviour. This doesn’t happen as much on the Two Tunnels though. There is space to interact better. Although I have been working to enable a consultation on the towpath improvements , I am sorry to see that my lack of clarity has led to a mistake creeping in about the date of a consultation. The 6th of July was to have been a ‘consultation’ for invited participants (councillors and residents’ associations or community groups) and was the idea of council officers working on the towpath project. No time or venue had been set. But that may now possibly have been superseded by the recently announced full public consultation by Martin Veal, Cabinet member for Communities. There is no date yet for that. Time is of the essence, since money must be spent by March and work is meant to start in October. A brief, but well publicised consultation would inform the public of the plans (no tarmac, and good signage giving pedestrians priority) and the advantages that improvements in the towpath should bring for all users, including wheelchair users and parents with pushchairs. Constructive suggestions can be taken into account. More public involvement will increase awareness of the need for consideration of the safety of all. Have updated the post to reflect the lack of an actual date. Thank you for feeding into this.